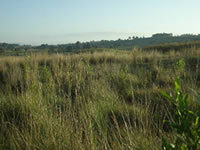 Grassland such as this in Kinangop provides a vital habitat for many endangered and endemic species. Photo © Nature Kenya. A conservation project to save Kenya’s Kinangop grasslands, set up in partnership with the World Land Trust (WLT) and Nature Kenya, has been shortlisted to win a €30,000 grant. This is a fantastic opportunity to protect some of the world’s last tussock grassland. Now all we need is your support. Why vote to protect Kenya’s grasslands? 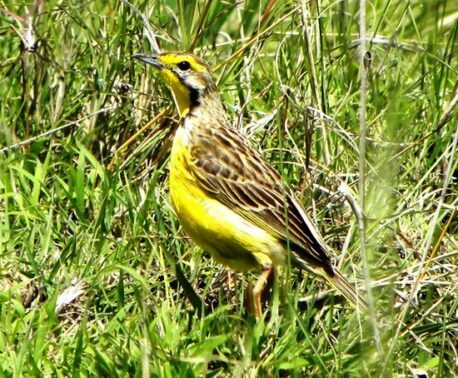 This habitat is vital for the endangered Sharpe’s Longclaw, a bird that has been likened to the Skylark: an icon of European grasslands. 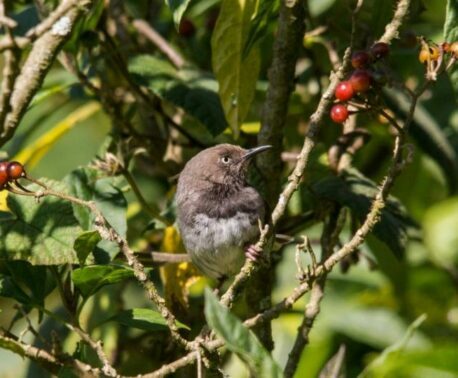 It is endemic to Kenya and can only survive in this rapidly diminishing habitat, which is being destroyed to make way for agriculture and urban development. The Kinangop grasslands are also a crucial habitat for hundreds of thousands of European birds that migrate to Africa every winter – from Swallows, Swifts and House Martins, to Northern Wheatears, Quails and Pallid Harriers. The disappearance of this habitat could have a devastating impact on the birds that Europeans consider to be ‘our’ summer birds. Largely unprotected, the remaining 190,200 acres (77,000 hectares) of tussock grassland is vanishing without note. 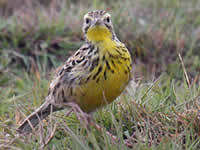 Nature Kenya is doing all it can to protect what is leftand has already turned 146 acres (28 ha) into a wildlife reserve that is protected forever – but this is just a tiny haven for Sharpe’s Longclaw. 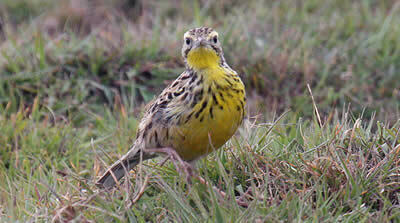 It is now vital that we extend the reserve, safeguarding more of this threatened habitat. How do I vote and who donates the €30,000? Voting takes place between the 25 March and 20 April on the website of National Geographic Germany. The €30,000 funding is donated by the European Outdoor Conservation Association (EOCA), a group of 66 outdoor businesses who raise funds to support conservation projects across the world. The EOCA has shortlisted 19 conservation projects and are asking the public to choose the one they want supported during 2011/12. The Kinangop grasslands project was kindly nominated by outdoor clothing company Nikwax, a long-term supporter of WLT’s work. Four national magazines are supporting the campaign – National Geographic Germany, Trail in the UK, Alpin in Germany, and LIFT / BIKE & Trekking / Sport Partner in the Netherlands. The magazines will feature a selection of different projects, asking their readers to vote on their favourite. The Kinangop grasslands project will feature in the April issue of National Geographic Germany (out on 25 March) and you can vote on their website from 25 March to 20 April. This is a crucial project for WLT; our partner Nature Kenya is working tirelessly to protect this threatened land and we would be really grateful for your support. The EOCA have been very supportive of WLT in the past, most recently awarding €30,000 to our Save the Indian Elephant Corridor appeal in 2010. This funding is enabling our partner organisation the Wildlife Trust of India (WTI) to secure a corridor of land in India’s northern state of Uttarakhand, allowing Elephants to safely migrate between one protected area and another. We could not have achieved this without generous support and we hope to realise similar conservation success in Kenya. Visit the National Geographic Germany website between 25 March to 20 April and vote for the Kenya project– help save the Kinangop grasslands for our migratory birds.